Improving glycemic, lipid, and blood pressure outcomes is the essence of diabetes care. Maintaining consistently positive results is an ongoing challenge for every healthcare professional. After years of clinical practice, Mayer Davidson, MD, has developed a series of algorithmic techniques that can increase positive results. 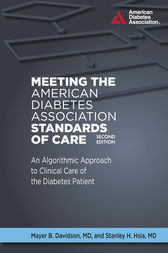 Based on the American Diabetes Association's Standards of care, this book offers detailed treatment algorithms that have been shown to be clinically effective in improving outcomes in people with diabetes. Standards of Diabetes Care, Evidence-Based Principles of Dietary Therapy, Glycemia, Dyslipidemia, and Hypertension.